Zhuhai Tianjian Chemical Technology Co., LTD is a professional in pharmaceutical raw materials, drugs, fine chemical products and its intermediates research, development, production and sales. The company has a group of new product development ability is strong, the production experienced senior technical and management personnel, can ensure that we in the development of new products and production in the number of transformation, speed, quality is in the domestic leading position. 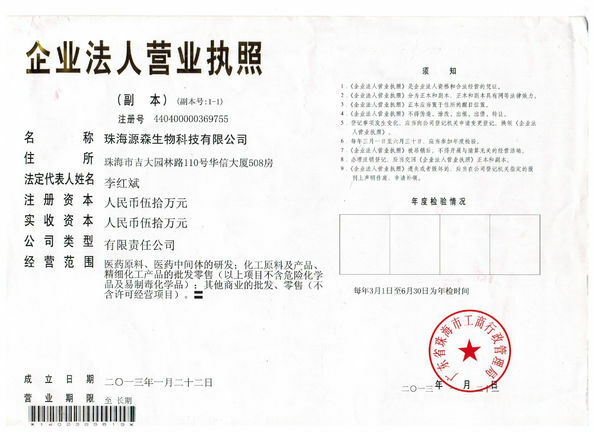 The company has passed the ISO9001 quality system authentication. The company with the import and export power . Our company's main business:, natural plant extracts, steroidal hormone chemicals, fine chemical products sales and other related technical services, achievement transfer; Goods and technology import and export business, etc.